WHEEL CARE KIT: (1) 275/300x21 inner tube for front wheel (1) 272/300 X 21 rim strip for front wheel (1) Rim strip for tubeless rear rim with a new valve stem design which is molded into the rim strip like a normal inner tube. 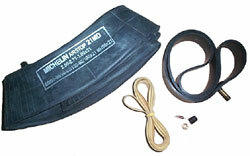 It eliminates troublesome leaks at the valve stem created by the old push through valve stem system presently used. The old design was prone to leaks because the hole in the old style rim strip was easily damaged by the valve stem.